The 2017 Sulis Scorpion championships were run in what can only be described as Flandrian conditions – it was going to be a Rule #9 day! The U12 race was 20 mins + 1 lap on the bottom of the Odd Down circuit. 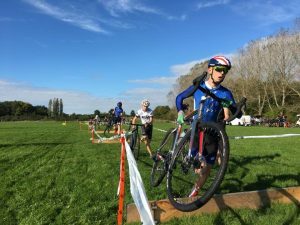 The Mass Start race was exactly that – the boys field (about 12) set off first followed by the Girls (4 girls) a few seconds later. The race settled quickly with the girls working well as a 4 person team to catch Dylan and Malin who were working equally hard to catch Tom – but Tom was too strong and was not going to be seen again! After 3 laps, the girls start to slow up so I put the hammer down to make the break across to Dylan and Malin. This took the best part of 3 laps and probably burned up all the “matches” in the Team Crowther box. Thankfully, Malin and Dylan were happy to continue to do the work and this allowed me to tuck in and recover. At this stage, I had 20 sec on Ellie who was working hard to cross the gap. With 4 mins to go to the bell lap, Ellie was gaining but our little gruppetto of three had done enough to stay away. On the bell lap, the group settled down for the sprint. Malin and Dylan had done most of the work so it would have been unfair to contest the sprint and I knew I had the girls race in the bag. Tom had taken gold for the boys, Malin and Dylan fought it out for the remainder of the podium places and I rolled over in 4th overall and winning girl. At that point, my biggest thought was getting warm and dry – it was a very exciting and tactical race that came down to making the break. Despite the conditions there was no crashes and standard was high – all credit to the Scorpions training regime. Looking forward to the winter season and getting ready for 2018. The following Sunday, the cross was back on the agenda at Hengrove. 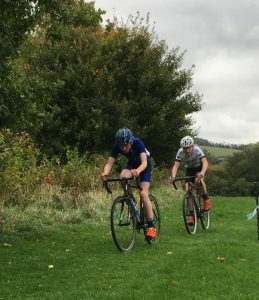 The blue train was again out in force, with Sam Butters signalling a further step forward in his form, riding into 4th place in the U16 race, but with both riders continuing to get closer to second placed rider Harry Denness week on week. Jenson and Tom were again the class of the U14 field, taking first and second, with Jenson finishing with a wheelie, just off the overall podium for the combined race. Nancy Walker was also racing on the 8th at Coventry CC’s double hill climb just south of Warwick. 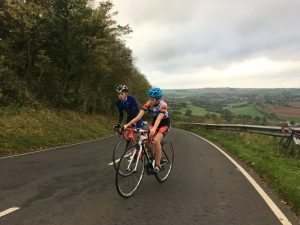 She has been training on one of the climbs – Edge Hill so was well prepared for the task at hand and put in another sterling effort as she continues to build towards the BUCS hill climb at the end of October. Nancy has been getting some serious racing in this autumn as she builds her experience ahead of the 2018 season, and she was straight back in action the following weekend at the Birmingham Uni crit – Nancy’s first ever criterium race. 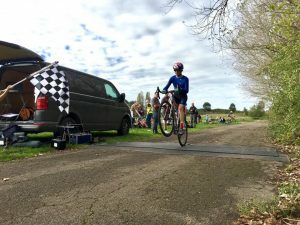 The course proved to be not too technical, and Nancy settled in to get a result in what turned out to be a tactical race. In the end, Nancy’s inexperience caught her out, as she was the first to blink; putting the pedal to the metal with 1.5 laps to go. She rode enough riders off the wheel to secure third place, but was jumped by two riders in the closing metres. She was again racing on the Sunday, at the Dover’s Hill Climb at Weston-sub-Edge. Nancy will be the first to admit that things could have gone better, as she got lost on her way to the start and missed her start time. She took a 30s penalty, and gave it her all to try and get the best result that she could. In the end, her time would have had her right in the mix for the podium, but with the penalty time she dropped out of contention. Again, lessons learnt and another good indicator that the form is there. 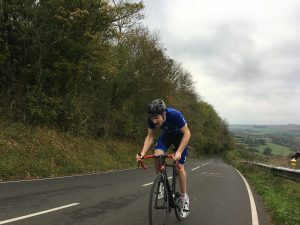 The Bath CC hill climb went a bit smoother for the Avid Riders. First up were Isobel and Colette Crowther, who were in a race with Josie Vallis for the U15 girls prize. They battled the severe gradients brilliantly and were just pipped by Josie for the win. Will Jewitt came charging up the hill next, and if he made it look easy, he may have left too much in the tank as he didn’t manage to match his training time on the same climb. This meant he missed out on the youth win by a few seconds, but was still on the podium with his dad for the family prize. Richard pulling out a pipe to entertain the crowd midway up the climb didn’t stop them taking the honours. In the women’s race, Aimee Parsons was making her first ever racing appearance. And what a start she made, taking third place and putting several more experienced racers to the sword! Deciding to park at Midford, pre-empting the busy car park at the trek centre in Wellow was a good idea, I met a lovely cyclist attending the same event and we pootled along the last bit of the two tunnels together. As soon as we got to Wellow we did a recci of the hill, which I’ve only every cycled down, a few weeks prior on the other hills of Bath Avid sport sportif- that was fun, so I knew this would be hard! The course itself starts at a gentle gradient so you can get a little speed up, then it ramps up the intensity and that’s when the lungs started to burn! I was definitely smiling at the first couple of people shouting ‘power’ at the top of their lungs. But once reaching the top bend containing all the spectators and of course the camera man the smile had turned into more of a grimace. You know the flat is just meters away and there were plenty of cowbells and ‘hups’ to keep me going all the way to the finish. A short cool down at the top of hill and then partial decent to where the spectators were to cheer on other participants. I had no idea how I had done, but had a great morning meeting lots of friendly people who were more than willing to share their knowledge and expertise with me on my first race. So coming 3rd female was a fab ending and very much unexpected! Harry Tucker put in the star performance though. Faced with a high quality junior field, including Ben Wainwright who had been only 0.3 seconds shy of Harry’s time at the VC Walcot hill climb. 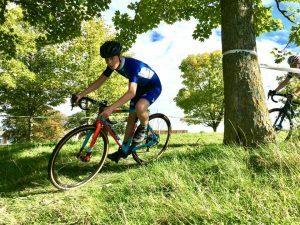 Harry was on fine form though, and took the win by a comfortable five seconds from Ben and 15 from Jacques Coates of Performance Cycles, who had looked very dangerous coming by a few minutes ahead of Harry. Good work captain! 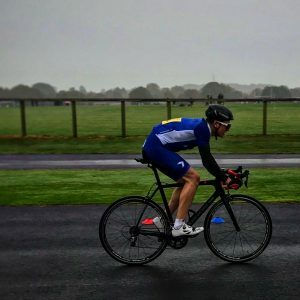 Tom was left with his BCDS nemesis glued to his wheel throughout the whole race despite numerous attempts to ‘break the elastic’ . It was setting up for a repeat of last weeks sprint finish until the duo came to the hurdles on the last lap and the BCDS rider made a mistake under pressure. The Avid rider saw this was his moment and put in an attack and together with his cool head cruised in ahead of his rival by a significant margin. 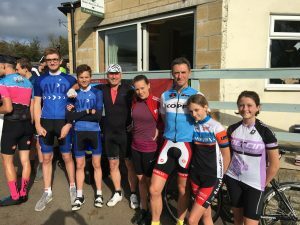 Fantastic racing by all, thank you to Isobel, Aimee and Paul Taylor for the words, looking forward to the rest of the racing this month!